If the mother is ever in town and you were thinking of treating her to one of London’s many 1-Michelin-starred eateries, don’t make the mistake of picking Arbutus. If the 5 months its taken me to write this review is anything to go by, it really was a quite forgettable experience altogether. Speaking of forgettable, we found ourselves playing attention-seeking 3rd graders all night long… hands stuck straight up in the air for minutes on end to get the waiting staff to notice we existed in our corner table. A full 15 minutes after we initially sat down, it finally occurred to one of the waiters, that maybe (just maybe…) it was time to take our orders. Having done my research the night before, I had already decided I wanted to start with their much-raved-about Squid and Mackeral Burger. I was not happy to say the least upon learning it had sold out (somehow, they even managed to make it seem like it was my fault for not asking earlier). I’m sorry Arbutus. If I ever walk through your doors again, I’ll make doubly sure to ask if you’ve sold out of your star dish before I take my seat. So this what I had to settle for instead…. 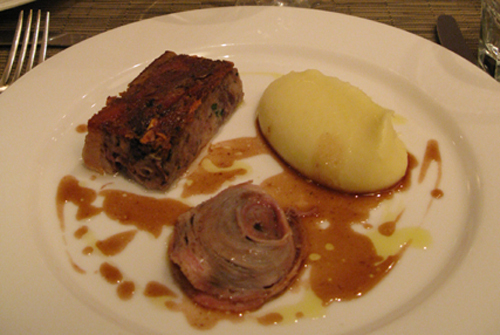 a not very pretty looking Braised Pigs Head (which despite being very tasty was a little on the dry side), a soggy Ravioli of Caramelised Onion (which looked like….. well… i’d rather not say) and Potato Puree (posh for rather ordinary Mash so I learnt). 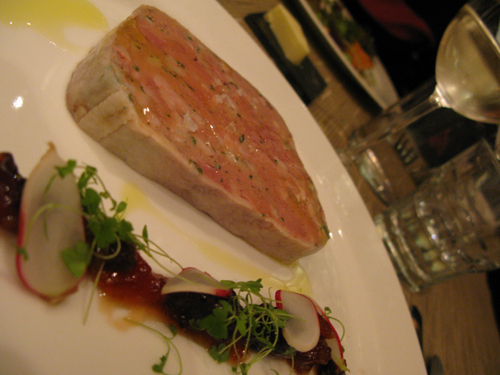 Jo, who also intended on ordering the Squid and Mackeral Burger didn’t fare much better with her Terrine. There was too much terrine with too little chutney…. too much pate with not enough meaty bite…. and even inspite of the thick slice of Toast it was served with, much much too rich to be eaten as such a large slab. Surprisingly, it was the simplest of our starters which was the only thing remotely close to warrant a Michelin-star mention. My mom’s rather understated Heritage Beet-Root Salad with Ricotta and Pine-nuts was as fresh as a meadow yet wonderfully complex in tastes and textures. It was the Sheep’s milk Ricotta which was the real revelation for me. 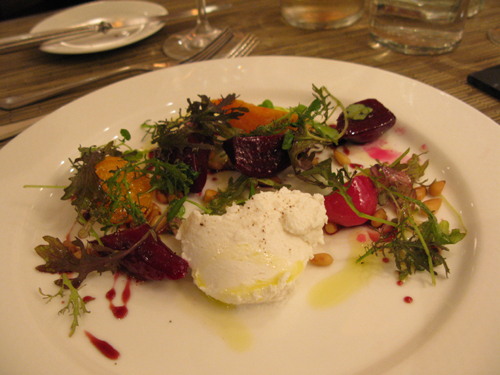 Light as a cloud with a subtle milkiness, the cheese complemented the sharp, natural sweetness of the beets perfectly. The hit-and-miss food continued with the main courses. 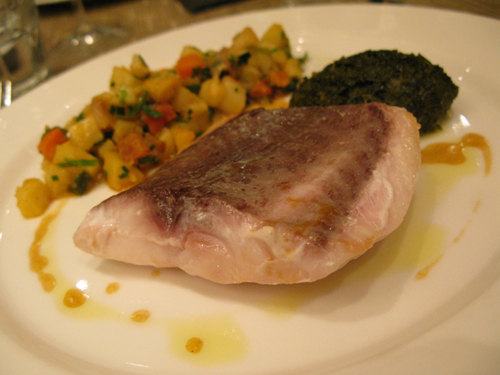 The ladies both opted for the fish – a Silver Mullet served up with Root Vegetables, Chorizo and Sea Purslane. Nothing wrong with the way the Mullet was cooked at all, but I can’t say I wanted much more than the two bites Jo offered me. Rather tasteless and dense in texture, it’s just not a very nice fish to eat full-stop, lacking the wow factor of the John Dorys and Hakes I would much rather pay for. I wasn’t too keen on the Sea Purslane either. It was far too salty given its salt marsh origins and its mushy, shrub-like texture was not something I felt I wanted to swallow voluntarily. Thankfully, the Rabbit I ordered was much better. 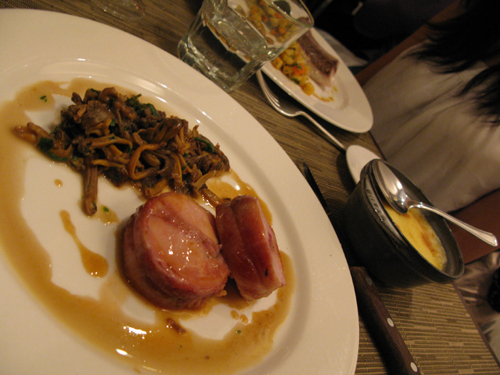 The pancetta-wrapped saddle was moist, tender and full of flavour. Served with a rich cottage pie on the side (baked in a cute little Le Creuset oven dish) and a generous wallop of earthy Sauteed Wild mushrooms, it was a lovely dish on the whole, but more akin to comfort food you would find in your local gastro-pub rather than mind-blowing, haute cuisine. If its any consolation, Arbutus do know how to make one cracking dessert. The Chocolate fondant they served up was simply outstanding. Think Ferrero-Roche on ecstacy, with a crispy praline base, topped with a solid piece of melted Valrhona dark chocolate and Salted caramel ice-cream. 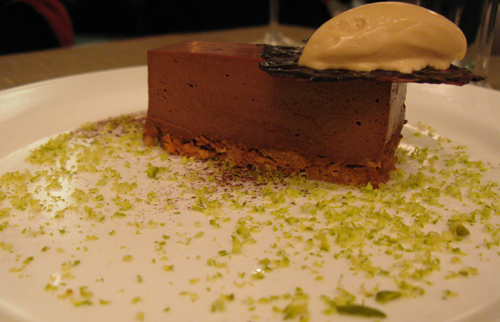 Its so good, its hard not to lick down every bit of the plate, the pistachio crumblings included. Needless to say, unless its just for dessert or to gamble on the elusive Squid-and-Mackeral Burger, I won’t be coming back here anytime soon. I do hope for Arbutus’ sake it was just a bad day in the office. If not, Michelin really are getting things wrong here… there are so many other non-starred restaurants I can think of which do better at similar prices. Shame you had a poor meal since it’s got fairly decent reviews on Urbanspoon. That being said, there are so many options I have yet to try I’ll probably skip this after your review. p.s. whereabouts fr M’sia are u fr? The dessert looks awesome. The chocolate fondant looks like a mousse on a praline base. Was there anything else inside it? Matt: it’s texture was like a thickish mousse if i remember correctly (been several months since). Godiva truffle + Belgian Chocolate + Ferrero Roche inner filling-ish in taste. Still waiting to taste your patissiere wonders after your Parisian course. How is Delicieux coming along? Are you and Mei Wan millionaires yet? That is quite a depth of chocolate flavour. Making me drool already.. Maybe I can give it a go at making it. Sounds like you had a crappy experience which is a pity because I love this restaurant more every time I go! If you haven’t been too scarred – give it one more go and definitely try for the squid and mackeral burger, it rocks. Great blog by the way. Rob: I think I’m still sore that they ran out of Squid/Mackeral Burger the night I visited – everything seemed to go a shambles from tht pt (apart from dessert!). I’m getting the sense most people have had better experiences than I did so maybe it really was a bad day in the office for Arbutus.